Tom and Andrew Sutton of Sutton Beef, Bundabar, Glenmorgan with their Santa steers. The steers sold to 330c/kg, reaching a top of $1,108 to average $933. Cattle were drawn from across Queensland. The usual panel of buyers was present and operating. Recent rain events have remained patchy across the supply area resulting in large runs of cattle yarded particularly from Western Queensland. The yarding was dominated by young cattle of mixed quality. Demand for quality cattle was strong across all categories but overall the yarding was of a reduced quality. Yearling steers experienced quality related price reductions across most categories. However, yearling heifers under 200kg were up by 16c/kg. Yearling heifers to background or feed under 280kg were also up by 17c, while yearling heifers to domestic feed rose by 26c/kg. Grown steers and heifers were present in limited numbers and saw only quality related price changes. Cows were also present in reduced numbers and medium weights were up by 8c to 20c, while heavy weight cows rose by 17c/kg. A good sample of light weight yearling steers to restockers sold to 336.2c to average of 311c, while a good sample of light weight yearling steers under 280kg to restockers sold to 330.2c, to average 310c/kg. Medium weight yearling steers to feed for the domestic market generally sold to 330.2, to average 310c/kg. Light weight yearling heifers to restockers sold to 288.2c to average 268c, while a large sample of light weight heifers under 280kg to restockers sold to 292.2c, to average 277c/kg. A fair sample of medium weight heifers to feed sold to a top of 298.2c, to average 282c/kg. Medium weight 3 score cows sold to 265.2c to average 254c, while heavy weight 3 score cows sold to a top of 276.2c, to average 270c/kg. Weaner steers under 220kg topped at 336c/kg and averaged 296c/kg, weaner steers in the 220-280kg range reached 336c/kg and averaged 297c/kg. Steers in the 280- 350kg range reached 330c/kg and averaged 300c/kg, and steers in the 350-400kg range reached 312c/kg and averaged 292c/kg. Feeder steers in the 400-550kg range topping at 310c/kg and averaging 297c/kg. Cows and calves hit $1,450/unit. DG & GH East, Wyora, Winton sold Charolais steers to 336c/kg, reaching a top of $929 to average $901. The Charolais heifers sold to 284c/kg, reaching a top of $778 to average $750. Sutton Beef, Bundabar, Glenmorgan sold Santa cross steers to 330c/kg, reaching a top of $1,108 to average $933. The Santa cross heifers sold to 298c/kg, reaching a top of $951 to average $808. BJ & PC Harrison, Bungaringa, Mitchell sold Charolais cross steers to 322c/kg, reaching a top of $1,028 to average $925. S Kidman & Co, Durham Downs, Eromanga sold Santa cross steers to 320c/kg, reaching a top of $903 to average $570. Banff Downs Pty Ltd, Banff Downs, Morven sold Santa cross steers to 318c/kg, reaching a top of $1,499 to average $824. Mt Cornish Grazing Co, Mount Cornish, Muttaburra sold Santa cross steers to 318c/kg, reaching a top of $943 to average $832. The Santa heifers sold to 288c/kg, reaching a top of $696 to average $654. Tindall Cattle Co, Darr River Downs, Longreach sold Brangus steers to 316c/kg, reaching a top of $1,053 to average $981. Rotherfield Grazing Co, Rotherfield, Longreach sold Santa steers to 315c/kg, reaching a top of $677 to average $609. Samuel Benham, Al-Fresco, Injune sold Angus cross steers to 314c/kg, reaching a top of $855 to average $809. The Charolais cross heifers sold to 286c/kg, reaching a top of $676 to average $657. WH Cameron Family Trust, Kheri Station, McKinlay sold Droughtmaster steers to 313c/kg, reaching a top of $1,084 to average $773. L Finch, Risby, Wallumbilla sold Charolais cross steers to 313c/kg, reaching a top of $986 to average $986. The Charolais cross heifers sold to 282c/kg, reaching a top of $742 to average $742. WN & MM Jones, Norolle Downs, Roma sold Santa cross steers to 310c/kg, reaching a top of $1,359 to average $1,326. Gray Livestock Partnership, Abrach Station, Muttaburra sold Santa steers to 310c/kg, reaching a top of $1,297 to average $1,143. TA & RJ & NA Wichlacz, Woodbine, Muckadilla sold Santa cross steers to 310c/kg, reaching a top of $1,198 to average $1,030. Brett and Sandy Southern, Gladfield, Mitchell sold Brangus steers to 308c/kg, reaching a top of $865 to average $834. PB & RM O’Brien, Ivanhoe, Roma sold Droughtmaster steers to 306c/kg, reaching a top of $1,385 to average $1,385. Dalmally Grazing Co, Dalmally, Roma sold Droughtmaster cross steers to 302c/kg, reaching a top of $907 to average $850. 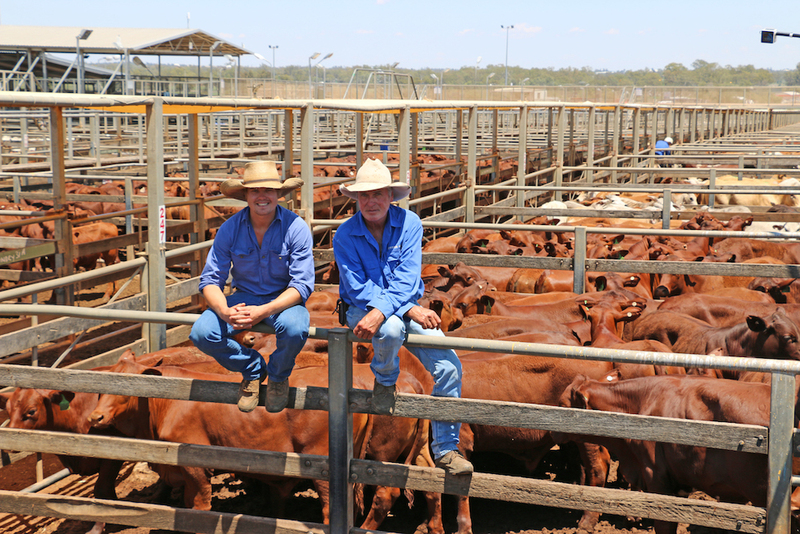 IT & NM Batt, Hillview, Muttaburra sold Droughtmaster steers to 300c/kg, reaching a top of $1,278 to average $871. Gurnett Grazing Co, Weaner Creek, Charleville sold Droughtmaster cross steers to 300c/kg, reaching a top of $1,110 to average $870. Heifers under 220kg topped at 288c/kg and averaged 254c/kg, while heifers in the 220 – 280kg range topped at 292c/kg and averaged 265c/kg. Heifers in the 280- 350kg range topped at 298c/kg, averaging 270c/kg. Heifers in the 350-450kg range topped at 275c/kg, averaging 264c/kg. Bondstock Pty Ltd, Maloneys, Roma sold Angus cross heifers to 290c/kg, reaching a top of $832 to average $750. Bonnington Beef, Annie-Vale, Roma sold Angus cross heifers to 287c/kg, reaching a top of $865 to average $767. WJ, WJ, NO & B Hartley, Bowen Downs, Aramac sold Brangus heifers to 285c/kg, reaching a top of $938 to average $731. Scott Keating, Sylea Lea, Mitchell sold Santa cross heifers to 284c/kg, reaching a top of $789 to average $626. BL & AM Rayment, Connemara, Jundah sold Droughtmaster cross heifers to 266c/kg, reaching a top of $591 to average $416. Cows in the 300-400kg range reached 231c/kg and averaged 190c/kg, while cows in the 400kg-500kg range reached 263c/kg and averaged 240c/kg. Cows over 500kg topped at 276c/kg, averaging 262c/kg. Whitton Cattle Co, Myrtleville, Injune sold Brahman cows to 272c/kg, reaching a top of $1,422 to average $1,271.